Is it really Thursday already again? Boy…time is flying by this summer! 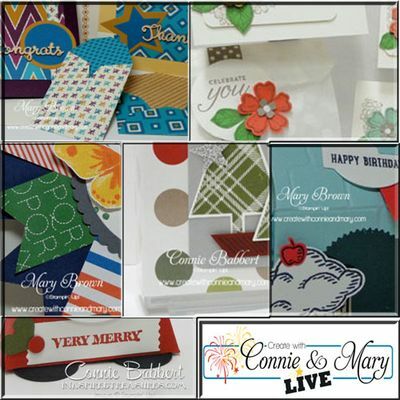 Well, since it is Thursday, it is time for another Create with Connie and Mary Thursday Challenge and this week we have a FUN sketch Challenge! I have to say…this is soooo not a typical card from me but I have totally fallen in LOVE with this print from the English Garden dsp pack! I just LOVE the colors! and used them to inspire my card! Yellow/Green flower print (English Garden dsp) – 4 7/8 x 3 5/8, Layer onto Delightful Dijon – 5 x 3 3/4. Mellow Moss dotted print (English Garden dsp) – 1 1/4 x 4 5/8. Cut piece to crate banner and flag add using dimensions. Wrap Very Vanilla Thick Twine around panel and add to card using dimensionals. Pear Pizzazz – punch 2 1/2″ circle, add using dimensionals. Stamp butterfly – base/So Saffron, outside edges of wings/Delighful Dijon stamped off once, inside stuff/Delight Dijon full strength, body and antenna/ Soft Suede. I cut mine out instead of using framelit since I wanted the antenna on there and added to the circle. Tie Very Vanilla Thick Twine into So Saffron button, add using dimesnionals. This entry was posted in Create with Connie and Mary and tagged Watercolored Wings. Bookmark the permalink. Beautiful, Mary! The color combo is so neat! I love the mixed DSP together…so pleasing to the eye! 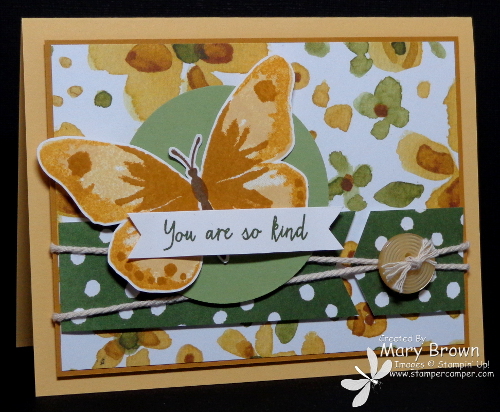 Love the pairing of the butterfly with the DSP Mary – not your usual style, but gorgeous none the less! Such a pretty card! Your butterfly is gorgeous and I love how you used the button to secure the twine. Love the combination of paper with the butterfly. It is bright and wow! I also think that is a great way to add a button and twine! Beautiful card Mary! I love your color combo, earthy and rich. Can’t wait to get this stamp set! This is such a great combination – so pretty and summery! Love that butterfly with this paper!